The Federal Bureau of Investigation (FBI) is recommending to the Justice Department that no charges should be brought against Hillary Clinton for her use of private email servers as secretary of state, FBI Director James Comey announced Tuesday. "Our judgment is that no reasonable prosecutor would bring such a case," Comey said after detailing the FBI's findings in its investigation of Clinton's use of personal email servers. "No charges are appropriate in this case." Comey announced that the FBI has completed its investigation of Clinton's use of a personal email server and is now referring the matter to the Justice Department to decide whether to prosecute. Comey made clear he didn't coordinate his statement with the Justice Department or any other part of the government. The FBI assessed whether classified information was improperly stored or transmitted on Clinton's personal email server or whether classified information was mishandled intentionally or in a grossly negligent way -- which is a felony -- or whether people knowingly removed classified information from appropriate systems or storage facilities, which is a misdemeanor, Comey said. He added that the FBI also investigated whether there was computer intrusion by nation states or hostile actors. Comey said that the FBI found that Clinton actually used "several different servers" and administrators of those servers during her four years as secretary of state as well as "numerous mobile devices" to send and receive email on her personal domain. When one of the servers was decommissioned in 2013, the software was removed, but millions of email fragments remained in a "slack space of the server" which the FBI had to use to piece the puzzle of her emails back together. "We searched through all of it to understand what was there and what parts of the puzzle we could put back together again," Comey said. From the group of approximately 30,000 emails that Clinton provided to the State Department, the FBI found 110 emails in 52 email chains that "have been determined by the owning agency to contain classified information at the time they were sent or received," Comey said. Eight of those chains contained top-secret information, Comey said, 36 chains contained information that was considered secret at the time and eight were considered confidential. Comey said that the FBI "found no evidence that any of the additional work-related emails were intentionally deleted in an effort to conceal them in some way." Therefore, Comey said the FBI has "reasonable confidence" that there was "no intentional misconduct" in connection to the sorting of Clinton's emails. 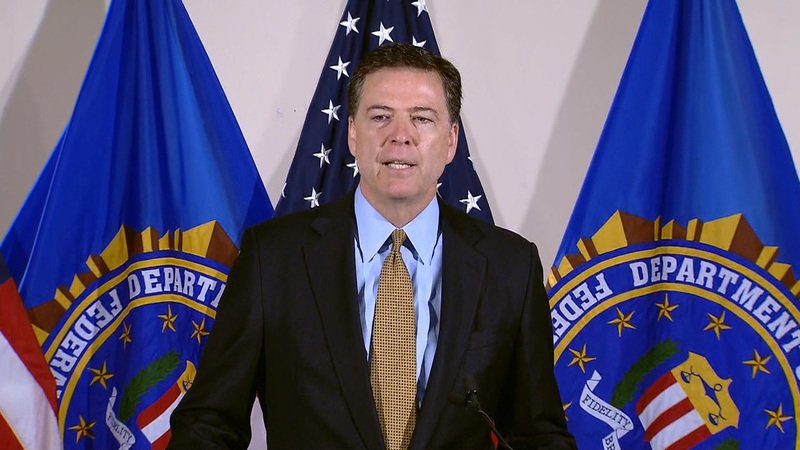 The FBI director, however, slammed Clinton for her general use of the email server. "There is evidence that they were extremely careless in their handling of very sensitive, highly classified information," he said, adding that anyone in Clinton's position or in the positions of people she communicated with "should have known that an unclassified system was no place for that conversation." Comey said that the FBI did not find "direct evidence" that Clinton's personal email domain was hacked successfully, but cautioned that the government is "unlikely to find such direct evidence." At the same time, he warned that "hostile actors gained access" to private email accounts with which Clinton was in regular contact. He also said that because Clinton sent and received work emails in territories of sophisticated adversaries, Comey said, "It is possible that hostile actors gained access to Secretary Clinton's personal email account." The conclusion of the investigation comes after Clinton met with FBI officials in Washington for three and a half hours Saturday about her use of the private email server she used while she was secretary of state, her campaign said. Federal investigators also interviewed Clinton's top aides, including Huma Abedin, who was questioned in April. Clinton had turned over her email server to the FBI in August, and at the time she turned it over, it had been wiped clean. "I always took classified material seriously," she told "Face the Nation" host John Dickerson. "There was never any material marked classified that was sent or received by me. And I look forward to this being wrapped up." There has been increased scrutiny of the Justice Department, which oversees the FBI, and Attorney General Loretta Lynch after she had a spontaneous half-hour-long meeting with former President Clinton early last week.The attorney general said Friday of the meeting with Clinton that she "certainly wouldn't do it again," a sentiment seconded by the former president and by Hillary Clinton, who told MSNBC in an interview that "hindsight is 20-20." Lynch confirmed Friday that she would be accepting the recommendations of the career prosecutors in the email case, though she stopped short of formally recusing herself from the matter.